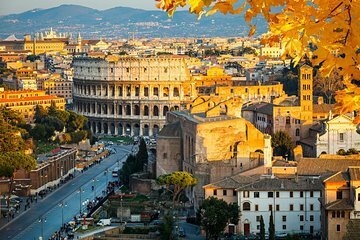 Visit the Colosseum, Palatine Hill, and Roman Forum with a personal guide on a private, skip-the-line tour in Rome. Bypass the lines for the 80 AD-built Colosseum and explore the first and second tiers of the amphitheater as your guide tells of the gladiatorial battles staged here. Afterward, delve into the ruins of Palatine Hill and the Roman Forum while learning about their history. Includes entrance tickets and choice of morning or afternoon departure. Our guide seemed to be in hurry to be done and would walk away from us. She seemed offended by some questions asked. Boldly asked for a tip at the end. My husband I were treated to a private tour that lasted nearly 4 hours in glorious sunshine. Our guide, Simone apologies for any misspelling, was truly an expert in all facets of the areas we toured. This included the history of the architecture and artwork/materials, Roman culture during multiple centuries, significant historical figures, and key events from the construction through the deconstruction of the key structures and artifacts we witnessed. She brough several visual aids to assist our imaginations to truly see the structures in their original glory based on historic records. We felt in-tune with the people from centuries past as she described their typical day and the priorities of their culture. She answered all questions fully in perfect English. Her personal enthusiasm and pride in her Roman culture was infectious. We learned so much and she drew our eyes that we would never have noticed and explained historical significance including transitions from BC to AD. Unbelievable! The ongoing excavations on Palatine Hill that seem to be uncovering the original Iron Age hut foundations considered to be the Casa Romuli simply blew our minds and were the highlight of an exquisite tour. Cannot recommend our guide enough!